Smith machines are large bulky pieces of gym equipment and not everybody has the space for them at home. 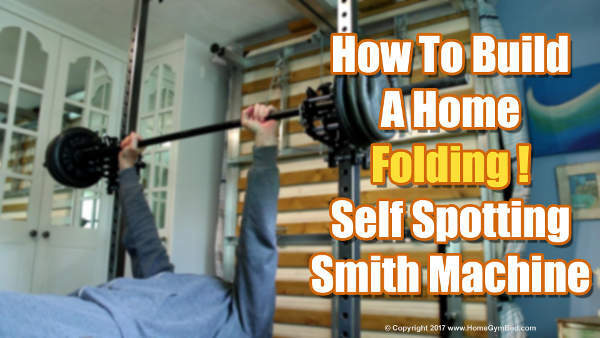 However, most of us do have room for a bed and if you’ve got room for a king size bed then you have got room for a different kind of Smith machine – the Home Gym Bed™. The Home Gym Bed™ is a folding DIY Smith machine / multi gym with the unique ability to fold neatly away underneath a bed when not in use. This means that no extra space is needed. How many Smith machines can do that? Most Smith machines have a fixed barbell which restricts the natural movement of the body. The Home Gym Bed’s™ unique tilt design enables the barbell to move much more naturally, as seen in the video below. A standard 6ft barbell is clamped to a pair of barbell slider units. The sliders incorporate 16 roller bearings per side, providing super smooth vertical movement. The self spotting system and built in safety stops makes for safer home workouts and minimise the risk of injury. Build a Smith machine with a difference! The video below is a brief montage of video clips taken from the Home Gym Bed™ build videos. It shows the construction of the self spotting system (Smith machine) part of the Home Gym Bed™. The Smith machine design of the Home Gym Bed™ could be adapted/modified if required to suit your needs. Plans/build manual, build videos and parts are available to buy.